The Emma Tote from Bonjour Teaspoon will be perfect for day trips and fun outings with friends! 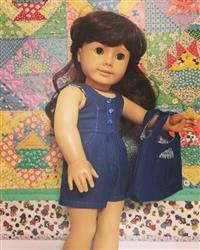 This tote is designed to be used with 18 inch dolls such as American Girl®, but will also work with most other dolls that we sell patterns for. It is designed to be made from woven cotton fabrics. This pattern is also available in a girl size Emma Tote, and also as a bundled package with the girl and doll size tote at a discounted price. Skill Level: This is an easy level sewing pattern. Sewing straight seams and curves are all that are required. This bag is lined so it will require turning right side out to finish. As usual Pixie Faire patterns do not disappoint. Love this site!! Quickly and easily made with great instructions. Such a cute accessory! The pattern for this tote was so easy to use. Although I have sewed in the past I was never good at it. Finding this was a great in that I could make this for my granddaughters and they were so happy. Thank you Pixie Faire.